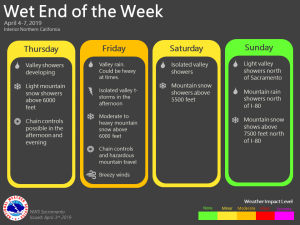 April 4, 2019 – Several weather systems will impact Northern California through the weekend. Hazardous mountain travel is expected Thursday evening through early Saturday with snow expected generally above 6000 feet. Gusty winds and thunderstorms are also possible Friday. Unsettled weather will continue early next week but with lighter precipitation amounts. Upper level high pressure ridge has slipped east of the state this morning with plenty of mid and high level clouds slipping over the region. A Pacific low pressure system now centered near 44N 141 west will pivot a couple of disturbances across NorCal over the next 24 hours. The first of the systems, now just off the coast will move into the north state this morning but is not likely to bring much in the way of precipitation. A cold frontal band now approaching 130 west is forecast to push onshore late this afternoon bringing increasing precipitation to the forecast area. Precipitation amounts with this system are not expected to be significant but most locations within the forecast area should receive at least some precipitation late today and tonight. Snow levels with this system should be at least a little below Sierra pass levels so travel impacts are expected with this system and a winter weather watch will remain in place. 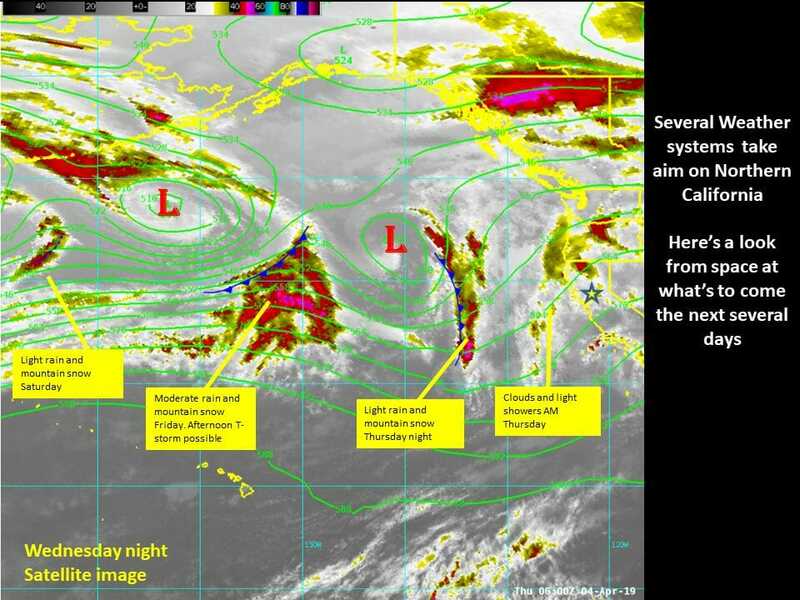 This system will lift into the Pacific northwest tonight as a still stronger Pacific Frontal system nears the coast. This, much stronger, frontal system is forecast to bring moderate precipitation to the forecast area on Friday along with gusty south winds and mountain snow. Snow levels with this system will remain below pass levels and combined with the gusty south winds will make for hazardous Sierra travel. Models seem to have backed off some on surface and 925 mb gradients for Friday afternoon. Current valley wind forecasts for Friday afternoon are below wind advisory criteria but future runs could result in above criteria values. Still seeing enough instability with this system to justify a thunderstorm threat at the lower elevations Friday afternoon. By Saturday morning this front is forecast to shift east of the state so should see decreasing showers during the morning hours. 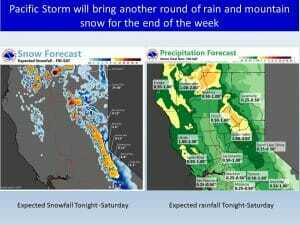 Although Sierra snow impacts will continue, much lower snow rates are expected during the day Saturday. 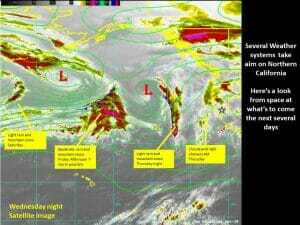 A fairly zonal flow will bring subsequent weather systems into the Pacific Northwest and NorCal Saturday and then again Sunday afternoons. 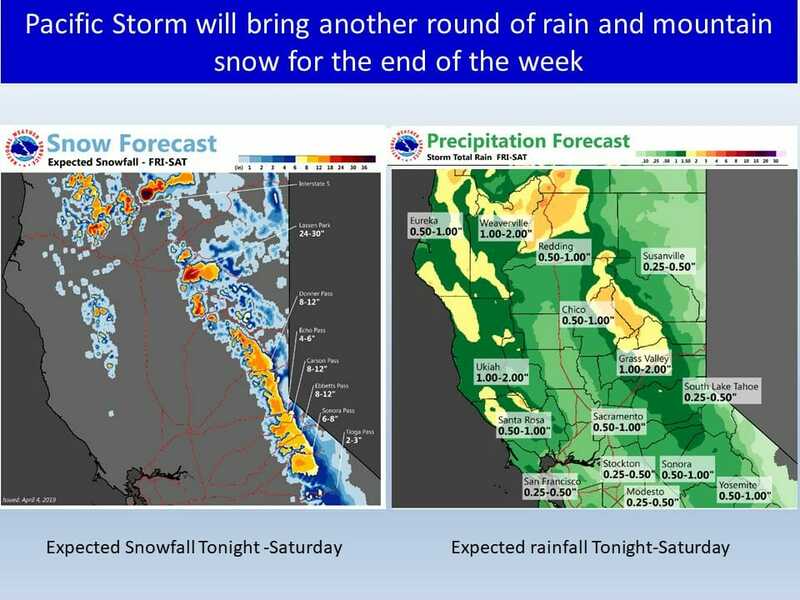 A slight ridge over the southern half of the state will keep precipitation mainly north of interstate 80 and precipitation amounts lighter over the weekend. Wet weather continues early next week as short wave trough moves through Mon/Tue. Models differ with strength of system and areal coverage of precipitation leading to forecast uncertainty. Snow levels start out initially above 7500 feet early Monday, but lower to 5000 to 6500 feet Tuesday. Snowfall amounts overall look light. Models continue to diverge midweek with solutions lowering forecast confidence. 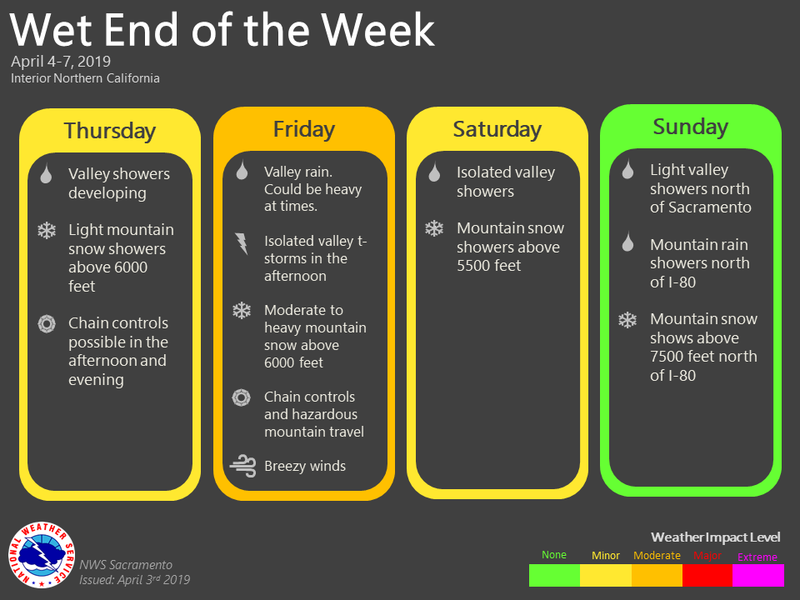 For now, keeping a threat of showers over the northern and eastern mountains Wed/Thu, with dry conditions in the Central Valley. High temperatures projected to be near or above normal through the extended period.